Maschine Studio Price Drop – Is there a Maschine Studio Update Coming Soon? 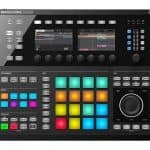 Native Instruments slashes prices $200 on it flagship hardware controller Maschine Studio. I’ve seen this too many times when Native Instruments and other companies drop prices of their products and release a new product shortly after. So is there a Maschine Studio Update Coming Soon? We’ll keep an eye out, and keep you informed, but if I had to guess there will be a new Maschine Studio or related product out by June or July. I have a feeling there’s something already waiting in the wings to replace it!! In the meantime, you can still get a 20% nice discount with no Coupon code: Needed. Is there a Maschine Studio Update Coming Soon? Is there a new Maschine Studio product or something new altogether coming out? What do you thing? What’s your favorite Maschine Studio accessories? Share your thought and comments below, and share this post with friends. Thanks for the information Greg. After reading your post, I know when I have the money, I’m going to buy a maschine. **Native Instruments MASCHINE is a trademark of Native Instruments GmbH. maschine-kits.com is not is not affiliated with Native Instruments.